The control of cardiovascular and metabolic function by the brain renin-angiotensin system. The renin-angiotensin system, a circulating hormone system that is very important for blood pressure control, is used in various tissues (e.g. - kidney, heart, adipose, brain) for paracrine/autocrine/intracrine signaling. One of our projects is aimed at mapping the neural circuitry that underlies the control of blood pressure and metabolic rate. Greater understanding of these mechanisms should lead to the development of novel therapeutics for obesity and obesity-hypertension. 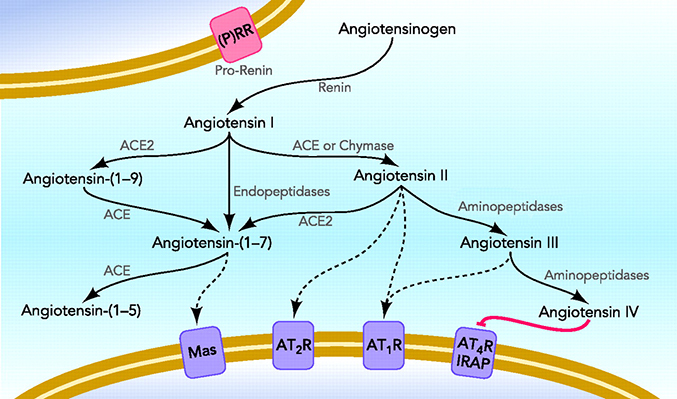 Diagram of the renin-angiotensin system. The regulation of resting metabolic rate by the adipose renin-angiotensin system. Angiotensin peptides within adipose tissues act to suppress resting metabolic rate. We are working to clarify the effects of angiotensin peptides upon adipose tissue function, and the mechanisms involved. Clarification of these mechanisms may lead to completely new classes of anti-obesity therapeutics, which work through the stimulation of resting metabolic rate (a superior method, for which there are currently no safe drug options). Fluorescent micrographs of the arcuate nucleus of mice, localizing expression of POMC, AgRP, and AT1A genes. Improving methods of assessing resting metabolic rate in vivo, and assessing the role of the gut microbiome in energy balance. Previously we recognized a need for improved methods to assess resting metabolic rate, as conventional methods (respirometry) are plagued with various shortcomings. Using advanced methods (combined direct calorimetry and respirometry) we have developed a method to assess non-aerobic metabolic processes in vivo, and determined that various interventions (anesthesia, modulation of angiotensin receptors, and high fat diet) differentially modulate aerobic vs. non-aerobic processes. Ongoing work is aimed at clarifying mechanisms by which the gut microbiome controls non-aerobic resting metabolism, and continuing development of superior technologies for metabolic assessment. 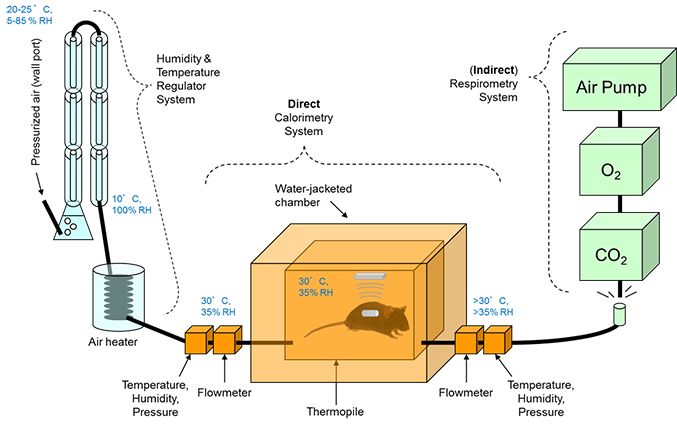 Diagram of combined calorimeter system that has enabled studies of the physiological significance of the gut microbiome. Investigating the role of vasopressin in the pathogenesis of preeclampsia. Electron micrograph of renal glomerular endotheliosis in mouse model of preeclampsia. Preeclampsia is a cardiovascular disorder of late pregnancy that includes sudden increases in blood pressure, renal damage, and fetal damage. We recently discovered that elevated arginine vasopressin secretion is a useful very-early diagnostic for this disorder in humans, and infusion of this hormone can model the disorder in mice. Ongoing studies are designed to identify the causes for increased vasopressin secretion, and the receptors and second-messenger systems involved, to develop novel drugs to prevent or treat this disorder.